Alex Krakovsky is a young Ukrainian living in Kyiv who is working to reform the Ukrainian archives system, and to get more old archival records digitized and put online. He scans and photographs old files in their archives, incredible documents that have never been photographed or microfilmed, not available anywhere else. He gets access to files from the archives' storage warehouses that even professional genealogists have never been able to get access to before. And he posts all the images online at the Ukrainian version of Wikipedia, for free use! Alex recently received a CZUR ET16, which is brand new kind of camera/scanner, made in China. It's a 16 megapixel camera, and can scan a whole book or file very quickly, can auto-focus and auto-adjust the lighting and contrast, can de-skew the crooked pages and can even correct for the page curvature close to the center of the book. It's also very fast, only 1.5 seconds per scan, so you can go through a lot of pages very quickly. And you don't need to squish the old delicate papers onto a regular flatbed scanner either, it takes the photos from overhead. Alex just posted some of his photos and descriptions of working with the new camera/scanner on a Ukrainian-language Facebook group called "Access the Archives". And a bunch of people who work in (or work for!) various Ukrainian Archives branches were really interested in his new scanner and would like one too. 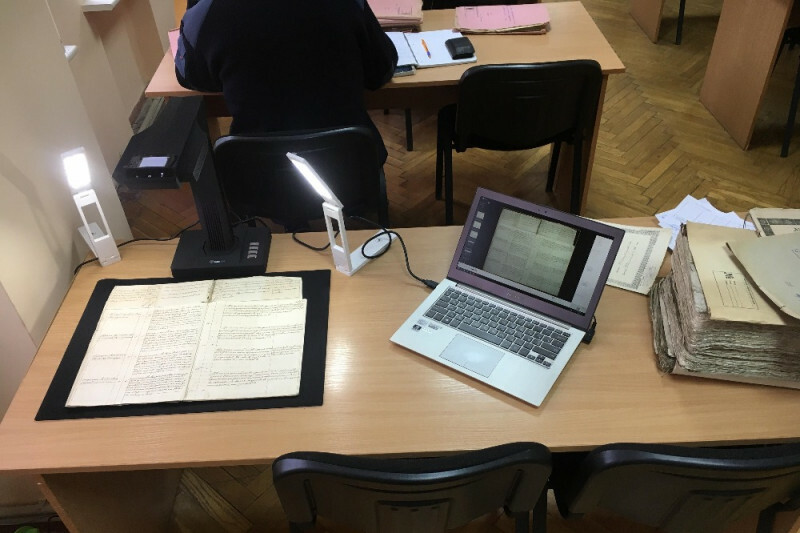 Alex says the Vinnytsia Archives (central Ukraine, south of Berdichev) and the Rivne Archives (northwest Ukraine) would definitely love a scanner like this, and in exchange they would supposedly scan a whole bunch of books, including old Jewish records books, free every week. And everything scanned would go back online for free, no restrictions -- they'd either upload it themselves or would send it to Alex to upload. Alex said some other archives might potentially be interested too: Kyiv (which is where Alex visits already, but this would be a scanner meant for the Archives itself), Poltava, and Transcarpathia. Maybe others would join when they see everyone else get a shiny new scanner? So. This GoFundMe is raising money to get at least two more scanners purchased and shipped to Alex in Ukraine, to distribute to the Vinnytsia and Rivne archives first, and any extra money will start going towards other archives branches: Kyiv, Poltava, Transcarpathia, and possibly others. So each scanner is $350 + $133 = $483. And we would need to raise a little extra to handle the GoFundMe fees, which are a little under 3% of all funds raised. So let's say that purchasing and shipping each scanner to Ukraine, from start to finish, would cost $500. And in return, the world will get tons of incredible old records scanned and put online for free from these archives -- not translated or transcribed, mind you, but at least it preserves the images! And we'd also get a promise that at least a few Jewish books would get priority for scanning each week. So, are you in? Want to help get more Ukrainian records scanned, and put online for free, not behind a paywall and not copyrighted? Let's do this! 1) Alex is my very distant cousin, so technically this project is helping a family member. But our common ancestor was born way back around 1800. 2) I'm also the founder/president of Reclaim The Records, a non-profit group that raises money to get genealogical records put online from American government archives and agencies, but this GoFundMe fundraiser has nothing to do with that organization. It's a standalone project. Got questions? Please reach out to me via GoFundMe -- or find me and message me on Facebook Messenger, that's usually much faster. 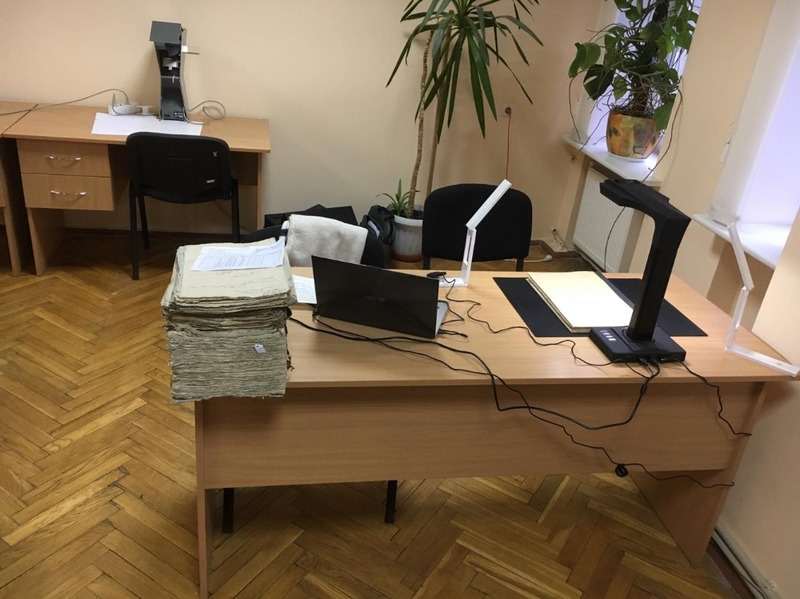 In the past few months, a few corrupt officials at the Ukrainian Archives have been trying to ban anyone from digitizing their holdings, using a new Russian-style proclamation passed without public input and without going through the proper governmental channels. Luckily, everyone's favorite Ukrainian genealogy troublemaker Alex Krakovsky is fighting back against them in court. Here's a great new video from GeneaVlogger Jarrett Ross, carefully explaining the history, the problems, and the legal issues surrounding this proclamation. It even includes surreptitious cellphone video of some of the archivists in Kyiv taking away books from public access. The video is about ten minutes long, and I hope you'll consider taking a look at it. Luckily, several branches of the Ukrainian Archives outside of Kyiv are flat-out ignoring this new proclamation. They have been steadily allowing the scanning thousands of old records books, or in some cases are even doing the scanning themselves on equipment we crowdfunded for them. And over the past few months, these new scans have been uploaded to the Ukrainian version of Wikipedia for free use, with new books appearing almost every week. In a few cases, the individual Archives branches are creating their own online archives websites instead, with the files stored in Google Drive, but still freely available. 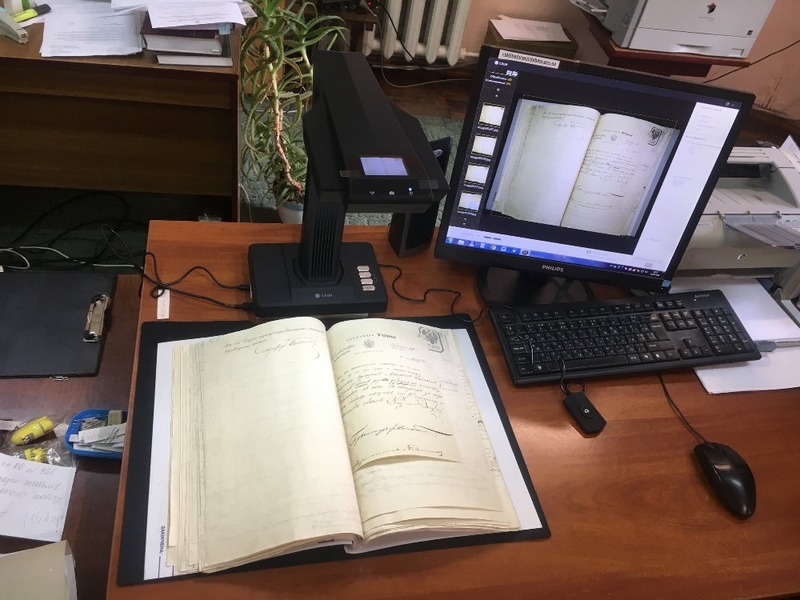 Combined, this means that HUNDREDS OF THOUSANDS of newly scanned high definition images of Ukrainian genealogical records have become completely free for public use over the past year. Here's the video. Please share! There is good news to report: everyone's favorite Ukrainian genealogy activist Alex Krakovsky let me know this morning that the regional archives branch in Kropivnitsky (Kropyvnytskyi), Ukraine -- formerly known as Elizabethgrad or Yelizavetgrad, and until recently called Kirovograd -- have been putting MANY MANY newly-scanned record books online on their website -- absolutely free to browse and download! 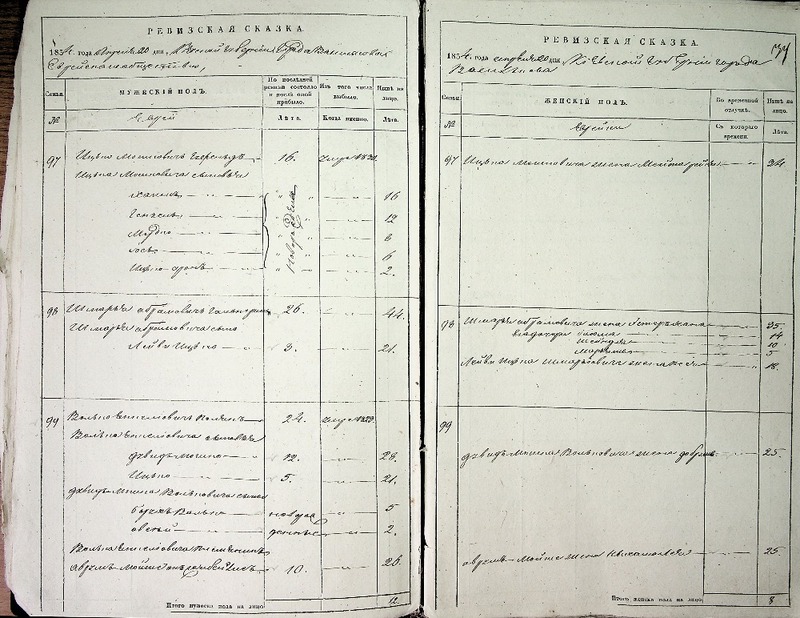 These record books have never been available anywhere before, were never microfilmed for FamilySearch. But now they're finally online, and in gorgeous hi-def full color! Record books from both churches and synagogues have been included in this first batch of scanned materials, as well as some other kinds of records such as Revision Lists and tax lists. Finally, all this historical material is getting digitized, and it's all going online for free! And how did the Kropivnitsky archives scan these old record books? Why, it was with one of the portable CZUR ET16 scanners that YOU helped fundraise to donate to them. THANK YOU! And as a side note, we're still fundraising. 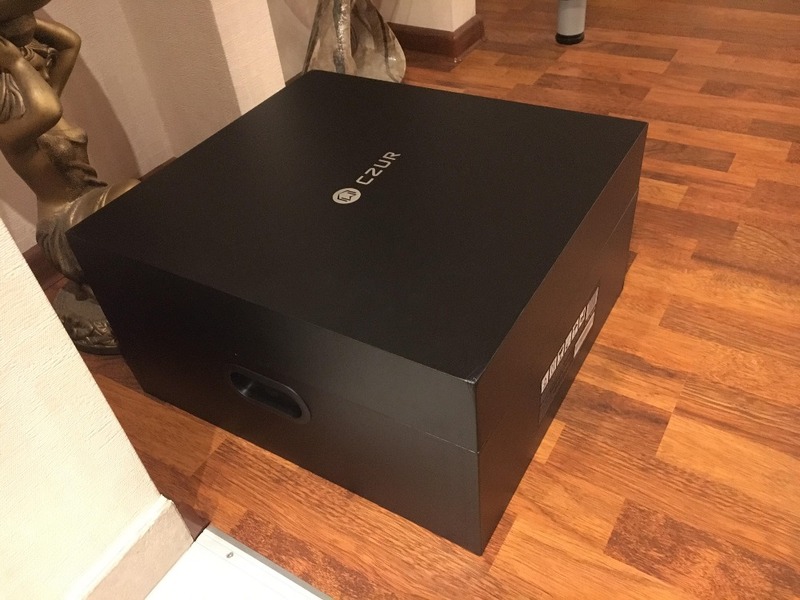 :-) Every extra $500 (approximately) that we raise means one new CZUR ET16 scanner we can send over to Alex in Kyiv, which he then distributes to various friendly archives to use. So please, feel free to pass along our GoFundMe link to other people, so we can hopefully get other archives branches to participate just like Kropivnitsky has so recently done. Hello, generous donors! We have a new update for everybody today. After being held up in customs for a few weeks, the four scanners have finally been delivered to Alex in Kyiv, and they are being distributed to various archives and are already being put to use scanning new books! 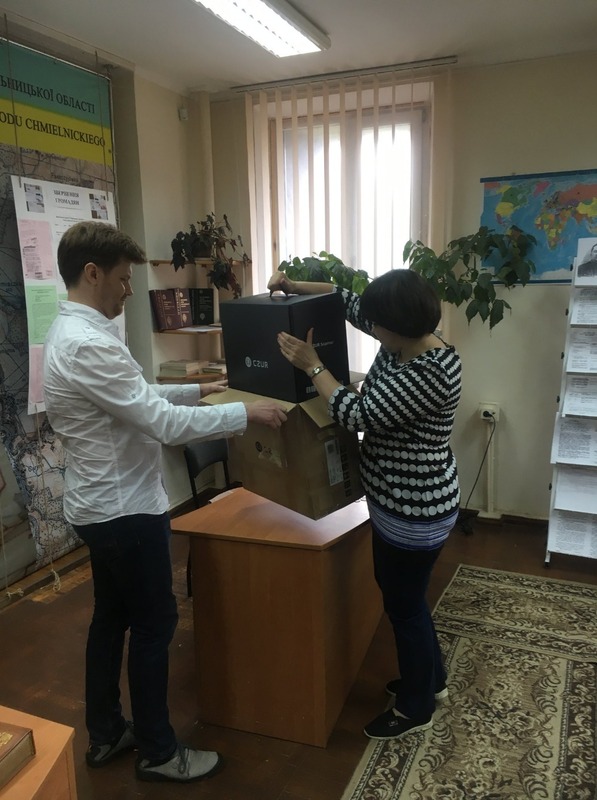 Here are some photos one of the four scanners being delivered to the State Archives of the Khmelnytsky oblast (Державного архіву Хмельницької області) yesterday. The archivists there were happily surprised to get such a present from the Ukrainian diaspora. 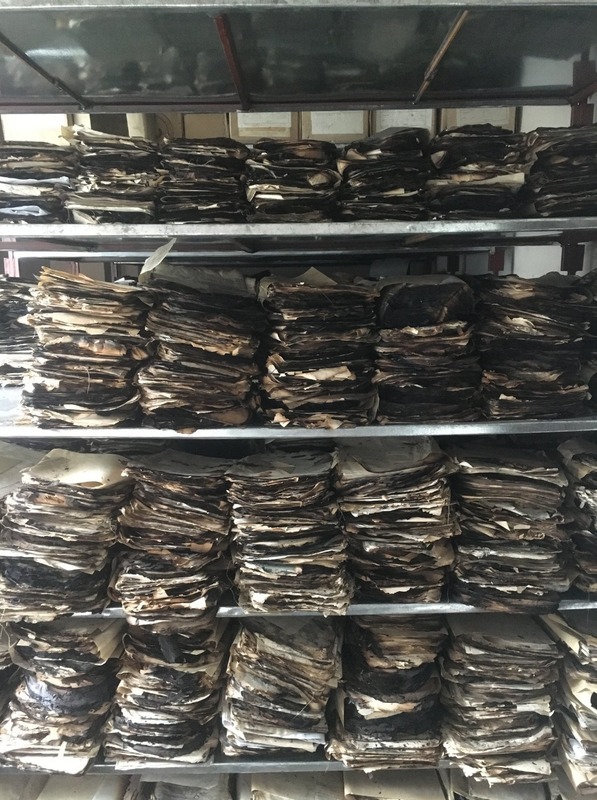 This archive in Khmelnytsky also holds the surviving records from the Kamenets-Podilsky (Kamianets-Podilskyi) archives, which were heavily damaged in a fire back in 2003. The archivists have been slowly restoring the remaining documents . If you look closely at the photos, you can see the burn marks on the edges of some of those rescued papers and books. We'll keep posting updates to this GoFundMe fundraiser over the next few weeks, as these four new scanners get distributed to the various archives. And we currently have another batch of scanners sitting in New Jersey, about to be shipped over, for even more archives to use. And none of this could have happened without your generous donations. Thank you all so much for your help! 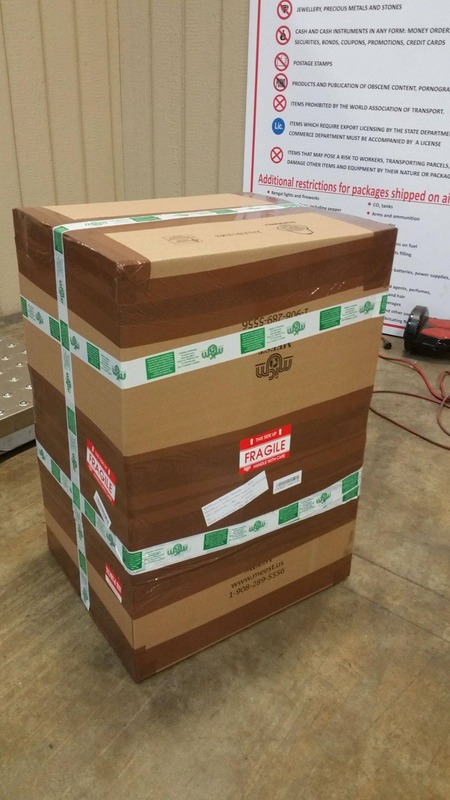 Four more scanners are being shipped over to Ukraine today! Genealogist Michelle Tucker Chubenko found a better and less expensive method to ship the boxes to Alex in Kyiv, instead of the US Postal Service. These four scanners will be sent to the Khmelnitsky/Khmelnytskyi archives, the Kropivnitsky/Kropyvnytskyi (formerly Kirovograd) archives, the Rivne archives, and the Poltava archives. They should arrive in Ukraine within the next two weeks. And we're about to order MORE scanners, too! We don't have the list yet where the next scanners will be headed, but we'll let people know soon. Ideally we would be able to raise enough money for every archives branch to have a scanner eventually. And this is all possible to your generosity and support for this project. Thank you all!